The information shared below can be used by anybody to clear and cleanse their energy fields! A Father brought his young son to our Angel gallery where we have hundreds of Angel paintings. He had purchased a painting of Archangel Michael for himself a few days before, but when he took it home his daughter snaffled (aussie for took) it for herself. 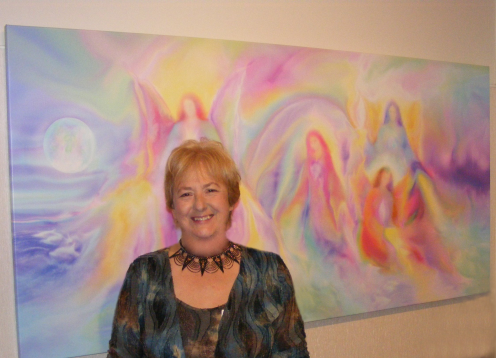 She intuitively put the Angel painting next to her bed and her sleeping problems stopped. 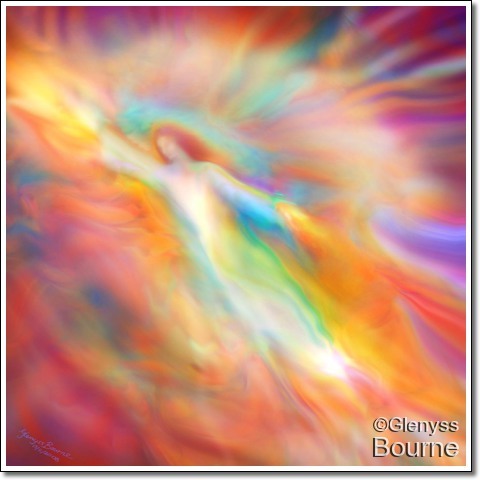 The painting served to connect the girl to her Angelic protectors. This prompted her father to bring her brother who was also having problems sleeping, to choose an Angel painting for himself. He chose a particularly strong version of Archangel Michael to put by his bed. Many children can see spirits and other etheric beings (unfortunately not all of these beings are positive energies), an ability that tends to fade away with age, if it has not been encouraged or understood by the parents. The presence of these entities can be very frightening for a child who doesn’t understand how to deal with them or what they are . Unfortunately this fear often attract a more unsavoury element to the child as fear lowers the vibration and attracts lower entities. I told him that if he was fearful, it gave the entities more power and attracted them to himself in the same way that bullies at school will pick on the timid and fearful children. He really seemed to understand this and I could actually see him grow in confidence and personal power when he understood that he had the divine right to say no if he wanted to! I told him that Laughter makes us very strong and powerful, and that if he still felt challenged after insisting the unwanted energies leave, he should take a deep breath and LAUGH at them and insist that they leave HIS space! Fear cannot exist in the presence of laughter, even if you are making yourself laugh! The last piece of information that he needed to know is that he always has BIG HELP available to him, anywhere, anytime! He can call upon his Guardian Angels or Archangel Michael for help and protection. All he needs to do is ask. Archangel Michael, is the Primary Guardian and Protector of Planet Earth and the Enforcer of Universal Law and Divine Justice. This is the message that came through from Archangel Michael; "Call upon Me when all else has failed. I will instantly come to you, wrap my wings around you, and surround you with the Golden Light of Unconditional Love. Do not despair for the Angels are ever with you and there is always help at hand. Remember that you are Immortal Spirits and the Earthly Journey, a mere adventure that you chose to experience." The Energy of the Archangels and the Angels is very focused on the Earth at this present time for we as Humans, and the Earth itself are undergoing rapid and profound changes. 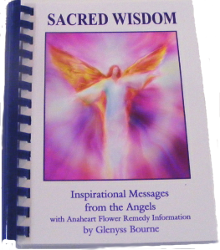 Archangel Gabriel offers healing to all in need. 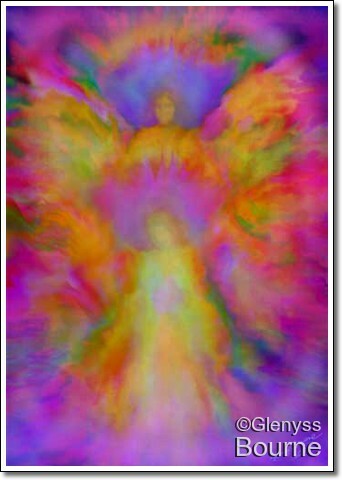 Archangel Uriel helps to reconnect you to Spirit. Archange Michae in Quiet Contemplation by Glenyss Bourne. 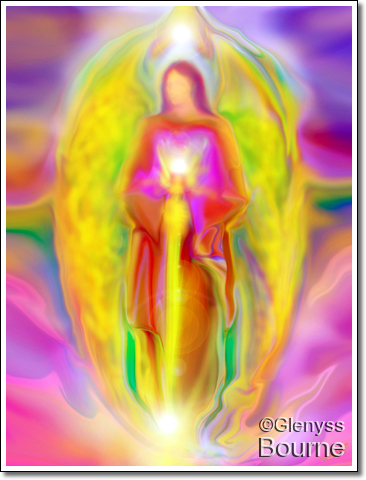 Archangel Raphael is pictured beaming his Healing Vibrations into the Universe.